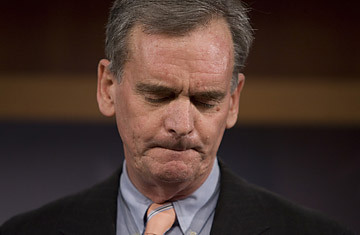 Sen. Judd Gregg (R- N.H.), announcing his decision to withdraw from his nomination as commerce secretary, Thursday, Feb. 12, 2009, in Washington. When Republican Senator Judd Gregg announced on Thursday that he no longer wished to be the Commerce Secretary nominee, he said that the decision was based in part on serious disagreements with the Obama White House over the 2010 census. That night on Fox News, Sean Hannity called Obama's plans for the census process "the biggest White House power grab ever," as his guest Karl Rove voiced agreement. The same day, House Republicans declared that the White House had "an unprecedented plan" for the census that "will taint results and open doors to massive waste of taxpayer funds." The latest problem arose when Obama nominated Gregg to head the Commerce Department, which oversees the Census Bureau. Local Democratic officials and advocates for minority groups protested the nomination because they feared Gregg would not support efforts such as sampling that they think will result in a more accurate census count. The White House responded by publicly promising that the census director would "work closely with White House senior management." It was a simple restatement of existing practice. But it was heralded by some liberals as a change in policy. The Huffington Post ran an article headlined: "Democrats, Minority Groups Relieved That Gregg Won't Oversee Census." Those reports, in turn, disturbed conservative activists who immediately condemned the White House "power grab." By Thursday, when Gregg bowed out, the GOP had launched a coordinated assault on the "politicization of the census." The White House was forced to issue a written clarification, noting that "this administration has not proposed removing the Census from the Department of Commerce." Why does it matter who oversees the census? In very general terms, Republicans would prefer to err on the side of undercounting and Democrats would prefer to err on the side of overcounting. The options can yield very different numbers for demographic groups and localities  and they have significant political and policy implications. This most recent skirmish is more manufactured than real, the result of willful misunderstandings. But it has its roots in an ongoing battle over whom the census counts  and how. As mandated by the Constitution, a census has been taken by the government every 10 years since 1790 in an effort to count every person living in the United States, both citizens and non-citizens. In recent times, the Census Bureau has arrived at a final count by relying on people to mail back surveys and then sending out census takers to go door-to-door in an attempt to fill in the gaps. Those census takers not only visit homes that have not returned the survey, but also seek to count those with no fixed address and those who live in nursing homes, prisons, shelters and other non-standard housing. The problem is that it is not easy to count every person in the United States, and some communities are disproportionately left out of the total. The 1990 census missed an estimated 8 million people  mostly immigrants and urban minorities  and it managed to double-count 4 million white Americans. Recent or illegal immigrants are often reluctant to answer questions in a government survey, and many experts fear that concerns about government misuse of personal data post-9/11 could hamper participation in the 2010 census as well. Children have also traditionally been underincluded in census totals. It's possible to use statistical modeling and sampling methods to supplement the census in order to arrive at estimated counts of various demographic groups. But there is fierce debate about whether these methods correct or distort the census count. In 1999, the Supreme Court ruled that sampling could not be used for the purposes of reapportioning congressional seats, and the Bush Administration chose not to use sampling to fill in the gaps of the 2000 census. The battle over how to count people only makes sense when you look at what is at stake. The redistricting of local districts and reapportionment of congressional seats is based on census counts  a state could gain or lose seats based on its population, and shifts within a state determine plans for redrawing political boundaries. The redistricting that took place in Texas at Tom DeLay's urging following the 2000 census  which swung six congressional seats to the GOP  is just one example of how dramatically political fortunes can shift based on the use of those crucial numbers. Census counts are also used to determine how many federal dollars may flow to a city or state based on grants and other outlays. Democrats have long charged that the undercounting of minorities and poor Americans prevents federal funding from reaching strapped communities. Meanwhile, Republicans argue that Democrats seek to boost numbers in order to create extra congressional districts in urban areas and to bring in more federal money for their constituencies. They charge that sampling  which Democrats support because it provides estimates for communities that can be hard to track accurately  is unconstitutional because the Constitution calls for an "actual enumeration" of the population. It seems fairly certain that the White House did not anticipate census politics to play into its nomination of Gregg to the Commerce post. And Gregg himself backed off the issue in a news conference after he announced his withdrawal, insisting that his concerns over the census were "slight" and refusing to address it further. Nonetheless, the experience has reminded partisans on the left and the right of their investment in the census. The fight to determine how it happens and what the consequences will be has only just begun.